Gran Canaria may not be as lush of an island as Hawaii and its beaches aren’t as renowned as Ibiza’s, but what it may lack in traditional outward appearances it makes up for with a unique, fun-loving personality, gay-friendly attitude and an adventurous spirit. 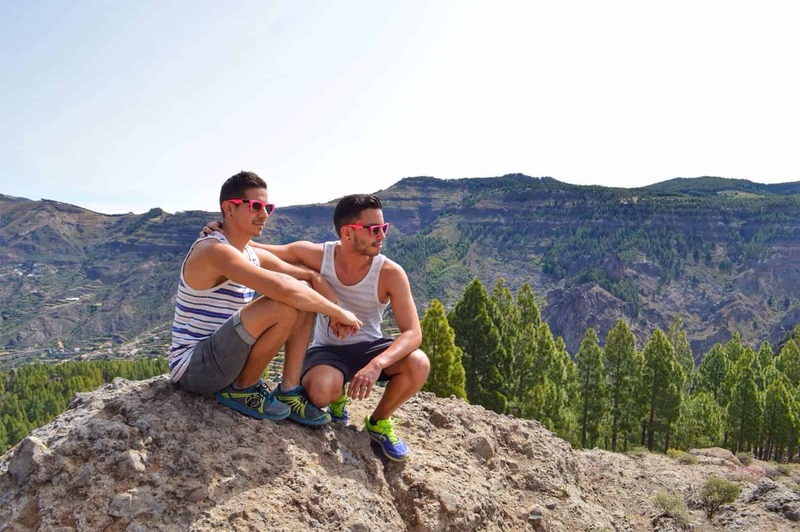 Gran Canaria is already a hot gay destination year round due to the mild climate and Maspalomas is its gay capital. 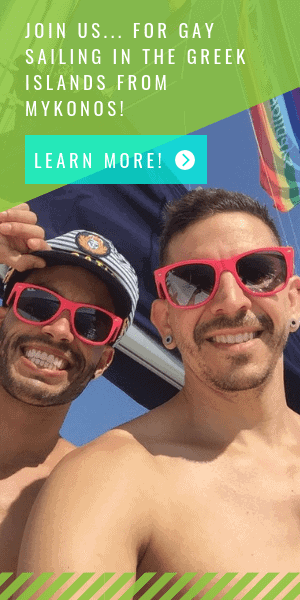 There’s a lot to do and see here as an LGBT traveler, so how should you spend your days to experience everything the island has to offer? Take these suggestions to maximize your time on this island of micro-climates, stretching sand dunes and active gay nightlife. 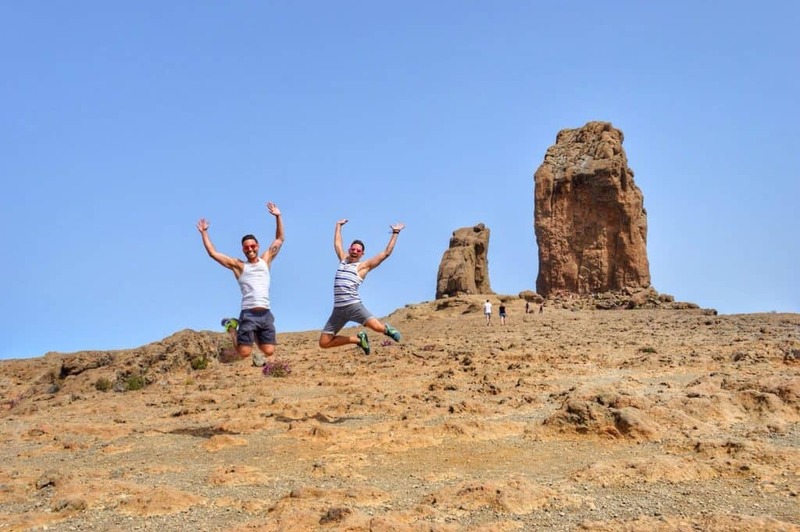 Special Offer – our friends at Rainbow Gay Tours just launched new tours in Gran Canaria including city tours, boat tours and more. Check them out here and use the booking code “TWOBADTOURISTS” to save 10%. Drag shows in Gran Canaria are like the residency shows of Las Vegas, with a slightly smaller budget and a lack of celebrity status. Still, they’re a hit and they’re a must. The Yumbo Centre in Maspalomas is the center of the gay nightlife with gay bars, clubs, restaurants and cafes. Here you’ll find quite a few drag shows with various acts focusing on comedy, lip syncing and even live singing in some cases. For a more authentic show, try to find the Spanish drag performers like those at Terry’s Show. If you’re looking for something raunchy, the Brits lead the pack at top favorites like Sparkles or Ricky’s Cabaret. Great performances at Terry’s Show / Yumbo Center! If you drive around the island you’ll notice that there are quite a few lookout points with beautiful views of the ever changing island terrain. One of the best spots for good views requires a bit of work to get to it but it’s a great way to add some physical activity to your trip. Head to Roque Nublo for a nice 20-30 minute, mild hike that ends at amazing rock formations that create that perfect backdrop for some fun photos (we did the classic jumping pose). It’s the second highest point on the island after Pico de las Nieves and gives great views of the island and even out toward Tenerife on a clear day. Bring a snack and take some time to relax in the shade of the rocks as you take in the sights. It’s not the moon, it’s Roque Nublo! 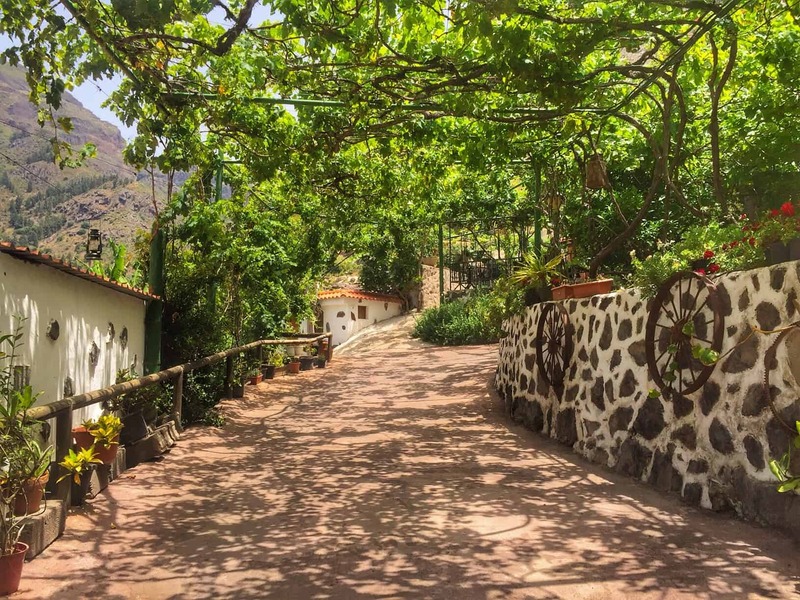 The Agaete Valley of Gran Canaria is the only place in Europe where coffee is naturally grown and is an interesting place to learn about local produce. As you head through the valley you’ll catch nice views of white painted houses clustered together along the mountainside. While there, take a tour at Bodega Los Berrazales to learn not only about their coffee crops, but also about the 40,000 bottles of wine they produce a year and the many other things grown onsite like grapes, oranges and bananas. For €6, you get to try three wines accompanied with Serrano ham, cheese, coffee and sponge cake. You can also pop into the gift shop to purchase a bottle of the wine which is not exported and can only be found on the island. Perhaps the best thing you can do to enjoy Gran Canaria is to take a private gay yacht tour to a secluded beach on the southern side of the island with a friendly, charming gay captain. 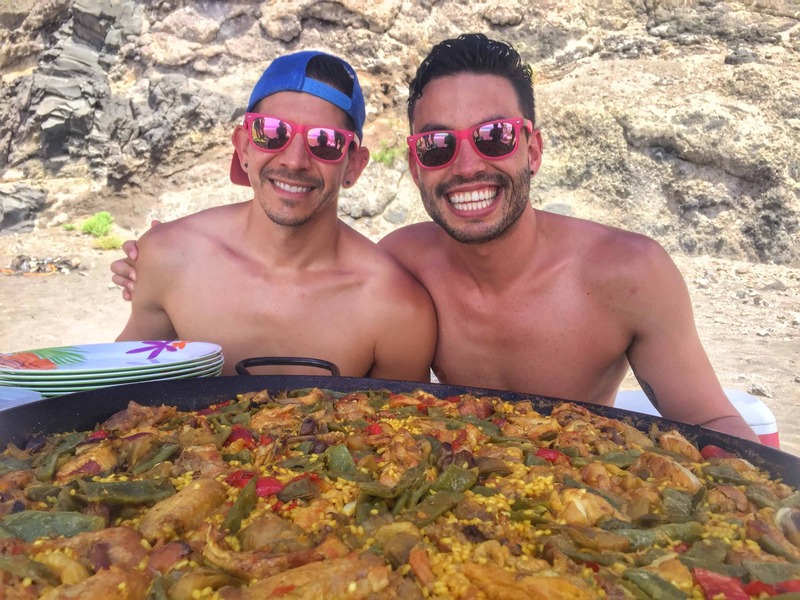 Canarias Gay offers an all day trip on the boat, time spent on the beach and provides tapas and quality drinks. You can also snorkel, swim and even see dolphins or whales along the way. The trip leaves from Puerto de Mogan and heads to Guigui Beach, an often empty black sand beach with the occasional hippie laying around. 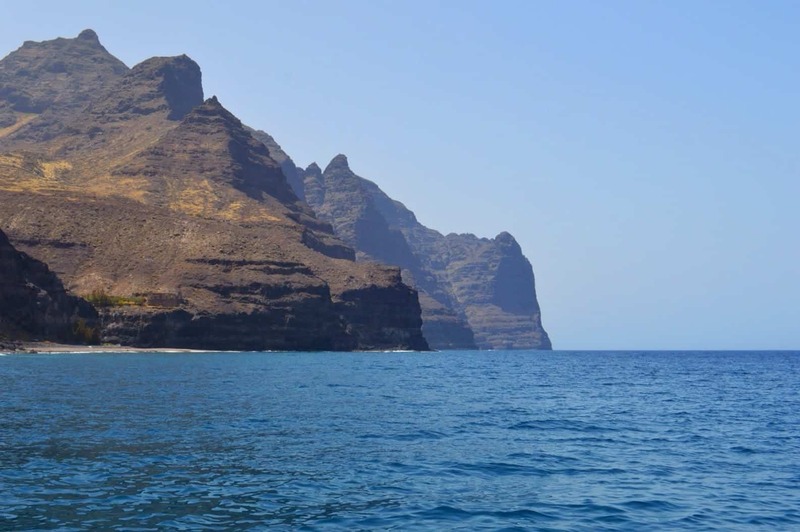 About a quarter of Gran Canaria’s 236 km of coastline is beaches. The gay beach is located at kiosk number 7, between the Maspalomas lighthouse and Playa del Ingles. You can arrive there in about 15-20 minutes walking along the shoreline from the lighthouse or through the dunes from Riu Hotel where you’ll find occasional cruising. Once you arrive, there are plenty of cheap loungers (around €2.50) and umbrellas that you can rent for the day or simply sprawl your towel out along the spreading sand. Sunbathe with or without your bathing suit, like most gay beaches, it’s your choice. On a very windy day you may just want to opt for your hotel pool as the blowing sands can be brutal. Checking out the Maspalomas Dunes! 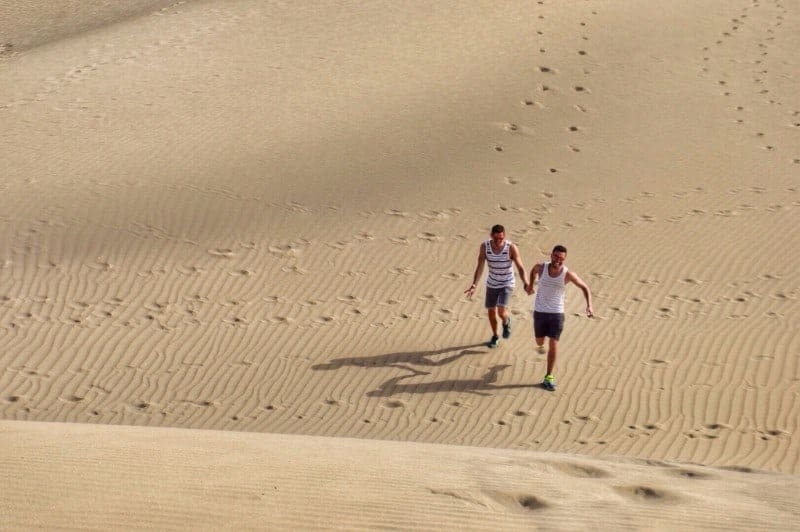 There are plenty of gay accommodations in and around Maspalomas. 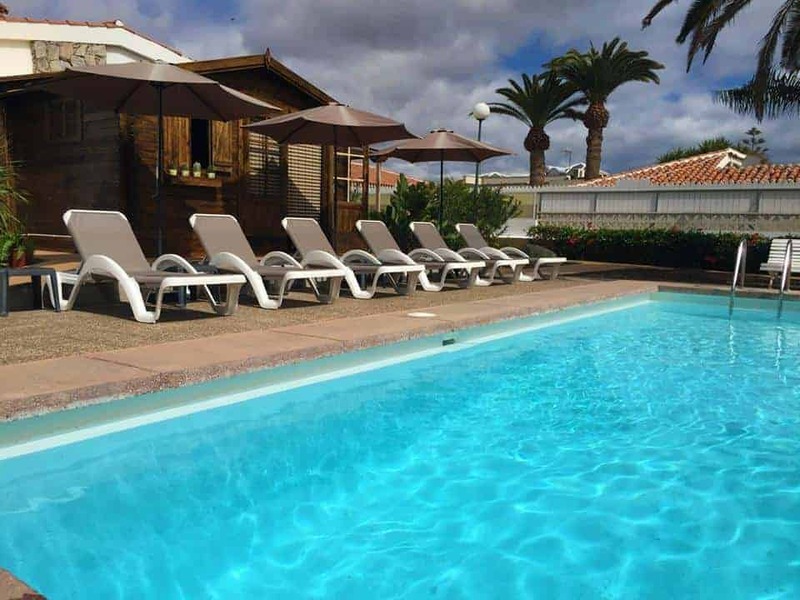 We recommend Paso Chico, which is a great budget option for private bungalows, with a pool right across from all the gay nightlife. It’s a small property owned by a friendly German couple and we stayed with a large group of friends. The bungalows offer plenty of space with a separate bedroom, kitchen and living room. The personal outdoor patio in front of each bungalow is perfect for relaxing with your morning coffee or having an evening cocktail before a night out. The gay beach is great to catch a tan, but having a (clothing optional) pool right next to your room is also a great convenience for lazy days as the beach can be a bit of a trek to get to. Choosing one of the many gay-friendly accommodations in Maspalomas will ensure a wonderful stay during your holiday. What do you think of Gran Canaria? What most makes you want to visit the island? Note: Our visit to Gran Canaria was sponsored by Paso Chico and the Gran Canaria office of tourism, but rest assured all opinions are 100% our own and we would never sacrifice our integrity for a sponsorship.